Balance Bike or Training Wheels (Stabilisers) | Which is best? Balance Bike or Kids Bike with Training Wheels. Which is Best? Like most of you reading this, I learned to ride a pedal bike using training wheels (a.k.a stabilisers). I remember getting my first bike for my 5th birthday and the joy of taking it out on the path while I pedalled along. I also remember the day when my parents took the training wheels off and I wobbled down the road with my dad running behind me, frantically trying to keep me upright. I hadn’t yet developed the coordination required to cycle independently so suddenly taking my training wheels off was pretty scary. Needless to say, there were many crashes that day but I eventually got there! Thankfully, there is now a better way that allows kids to get started as young as 2 years old – balance bikes. But what are the main differences between balance bikes and kids pedal bikes with training wheels? A balance bike is a bike without pedals. To move forwards, the child pushes off the ground with their feet. They usually start by walking while sitting on the saddle, followed by running then gliding with their feet off the ground. Once they can cruise along with their feet up, they have learned to balance and are ready to begin pedalling. With a balance bike, the child learns to balance and steer first, then can progress to pedalling in their own time. Learning to pedal is much simpler than learning to balance, and since the child will be able to coast along comfortably, there is no urgency. The classic “old school” kids bike with cranks, pedals, chain, front and rear brakes. The child learns to pedal first while being supported by the training wheels. Once the training wheels are removed they have to try and learn the more complex skill (balancing), while pedalling, which is much harder. If kids learn to ride using a pedal bike with training wheels they don’t develop their balance as the training wheels keep the bike upright, like a crutch. Once the training wheels are removed the child will immediately need to (try to) balance and un-learn many of the bad habits that training wheels can cause (see below). I’ve been there for lots of kids' first time switching from the balance bike to using pedals and have been amazed at how quickly the child cycles off into the distance. Usually 15 minutes or less is all it takes to get used to the pedalling motion. A new pedal bike will be needed for this stage, unless it's convertible. It seems the majority of brands that still use training wheels also have bad gearing on their pedal bikes. If the gearing is too hard, i.e. big front cog and small rear cog, it will be difficult to turn the pedals and get the bike to move forwards. When you add increased weight into the mix, it’s no wonder that kids often need a parent’s helping hand to get going. A balance bike's low weight, low center of gravity, simplicity and lack of training wheels means it will corner like it’s on rails and be lots of fun for the little rider. A bike steers by leaning and since training wheels keep the bike upright, they can make it difficult to turn. Even worse, a bike with training wheels will lean away from the corner onto their outside wheel so the rider will learn to lean the wrong way. Balance bikes can be used on most surfaces (within reason!) and can be used on sloping surfaces no problem. If it has brakes it will be much easier to control on an incline than if it's brake-less. Since balance bikes can pretty much go anywhere, they help develop your child’s sense of adventure! The small stabiliser wheels are difficult to use on inclined slopes (they topple over sideways), can't roll over rough surfaces and dig into soft ground making progress slow and frustrating. Balance bikes are typically made of aluminium, wood, steel and plastic. Aluminium typically provides the best balance of weight, strength and durability. Balance bike’s simplicity makes them lighter than their stabiliser clad counterparts. As well as making them easier to ride, it’s also handy for parents to carry if their little one has done enough biking. The majority of kids pedal bikes are made of heavy steel though some brands use aluminium. If a bike is heavy it makes the bike difficult to manoeuvre and pedal along. The training wheels then add extra unnecessary weight to an already heavy frame. Balance bikes use either rubber tyres or EVA foam tyres. While foam tyres are puncture proof and lightweight, they can wear out quickly and don’t provide much grip. Rubber tyres with air tubes provide better cushioning and more grip, very important when your little one is turning corners. Pedal bikes will almost always come with rubber tyres to provide grip to the rear wheel for pedalling. The little stabiliser wheels are hard plastic which makes a horrible rattling noise. The mounting brackets often bend too which can make the bike lean on one side more than the other. The saddle on a balance bike is usually quite low so the child can have their feet flat on the ground and be able to walk and run easily. In order to pedal easily, the saddle should be high enough so the child’s leg is almost straight at the bottom of the pedal stroke. The saddle will be higher than on a balance bike as there needs to be enough clearance so the pedals don't hit the ground. When sitting in the saddle, the child will only reach the ground with their tip-toes. Some balance bikes are brake-less (at the expense of the kid’s shoes!). Many have a rear brake only, while the LittleBig has both front and rear brakes. In order to be able to stop quickly and safely, at least one brake is preferable. Kids pedal bikes should have both front and rear brakes. In the USA the rear brake needs to be a coaster (back pedal) brake while elsewhere V-brakes or side-pull brakes are normal. But can’t you make a balance bike by taking the pedals off a pedal bike? Yes, you can convert a normal pedal bike to a balance bike by taking off the cranks, pedals and chain. However, the saddle will probably still be too high for smaller toddlers to have their feet flat on the ground. Many kids pedal bikes are made of steel and will likely be too heavy for kids to push along. Not to mention, you need the required skills to take off then re-assemble the cranks, chain, bottom bracket etc. which can be a bit fiddly. Handlebar reach on both balance bikes and kids bikes with training wheels can vary dramatically. On either bike, it’s best to have a longer reach so the body is leaning forwards in an open arched position with the arms slightly stretched. If the bars are too close to the saddle it makes the cockpit cramped and will make the bike feel twitchy. Wide bars are also preferable to keep the steering stable, a must for when your child is reaching warp speed! On our LittleBig bike, the geometry changes as it converts from a little balance bike to a big pedal bike so adapts with your growing child. We’re always delighted to see kids outdoors on bikes of any kind, whether on a child seat, balance bike, or bike with training wheels. But it’s even better to see kids zooming along independently with their parent often lagging behind. It’s not just us, even classic brands like Raleigh are moving away from bikes with training wheels to balance bikes. So if you’re looking for a new bike for your toddler, don’t forget there’s no need for training wheels, go for a balance bike instead and give them the best start on two wheels! 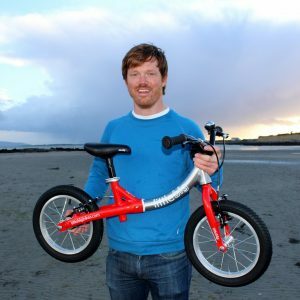 Simon Evans – round the World cyclist – founded LittleBig in Ireland in 2013. 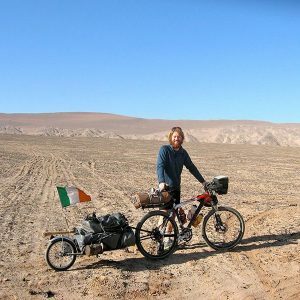 Simon was part of the two-person team who in 2010 completed the first Irish circumnavigation of the globe by bicycle. Simon is also an engineer and his experience in sustainable design, allied with his wealth of bicycle knowledge, propelled him to design and develop the LittleBig adaptable children’s bike. Is there any research-based ‘evidence’ that has ever been published in a learned peer-reviewed journal that supports the assertions made about the effectiveness of using balance bikes to teach kids how to ride? It intuitively feels right but so did the idea that the sun revolved around the earth! There have been limited studies but it’s not a topic that’s been covered in detail with hard evidence. Most of the feedback I’ve seen (and experienced personally) is that having used a balance bike, kids will progress to pedalling within 15mins (or even less) and at a younger age than when using stabilisers. Most of our customers fit pedals to their LittleBig bike when their child is 3-4 years old. I’m still shocked when I see older kids of 6 and 7 trundling along on traditional bikes with their stabilisers attached. Fancy €10 off your LittleBig bike? Use coupon code – stabilisers – for €10 off at our shop.